My friend Eric (former long-time New Paltz resident) is coming to town tomorrow on tour, and I put together a show for him and asked some other local pals to play. 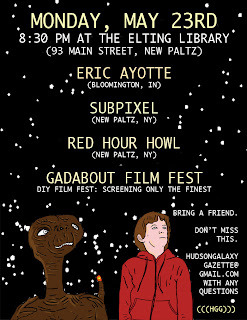 He's both playing music and screening his Gadabout Traveling Film Fest, and then SubPixel and Red Hour Howl are playing, too! When it came down to making a flyer, I decided to return to what I identify with most for its focus: E.T. I drew up him and Elliott, and then just typed in all the info, because I have a creeping feeling that flyers need a break from my cursive. I was in Chicago last week on business (it feels funny to actually say that and mean it) and dropped off more zines at Quimby's, so they are stocked again for the ordering/picking up. I also recently sent more down to Bluestockings, so they're stocked as well. The Gremlins have been playing shows, most recently last night's annual TAURUS PARTY in Rosendale, honoring all the great taurus' gracing our lives. We're playing at SNUGS on June 2nd with Los Doggies to fulfill all of your blessed drinking/Joy Division needs. Come come come come come come come! 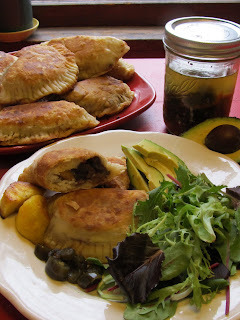 I updated FOOD CATS recently, where I show you how and urge you to make empanadas! They're great, so what are you waiting for? Fill 'em with pretty much anything, although I do make a few suggestions in the post. Click here to get to it. 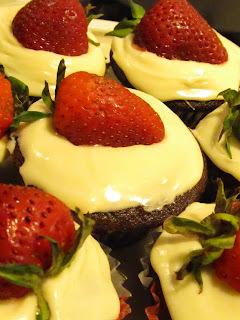 It feels obligatory to include photographic evidence of the red velvet cupcakes Sam and I made last week. They tasted something like perfection. A bunch of us have been busy trying to get the Hudson Galaxy Gazette calendar for June launched asap. This is the first month, and is sort of just a beginning, and admittedly a little sparse until we get the ball rolling more and hopefully generate a bunch of interest. This has meant many meetings/sometimes at breakfast establishments, trying to use a ruler to its full glorious potential and not spill coffee all over everything at the same time. The website should be up-to-date, and I'll post the calendar and links when they're ready. For June, I'm hosting a few things, including a writing group, game night, organizing potluck, and a band-in-a-hat meeting! We finished up the calendar tonight, and hopefully will have copies available at the library show tomorrow night! My friend Angie recently mailed me a surprise gift of a contact microphone, and I've been having a lot of fun taping it to things (namely, my throat) for maximum amplification/fuzziness/excitement. She's an electronic angel. I have hopes that it will make its way into a musical project in the future. I'm currently in the midst of moving, which only gains relevance to this here "productivity" blog because it is quite a bit of work and requires more finesse and mental capacity than most creative things I ever manage to do. Plus: I have to say goodbye to my beautiful mint green walls I painted when I moved into this current room last fall. Boiled down: my life is in boxes for a little while, please be kind to me. Over and out. i honestly wish i could come see the gremlins play at snugs! is it summer already.